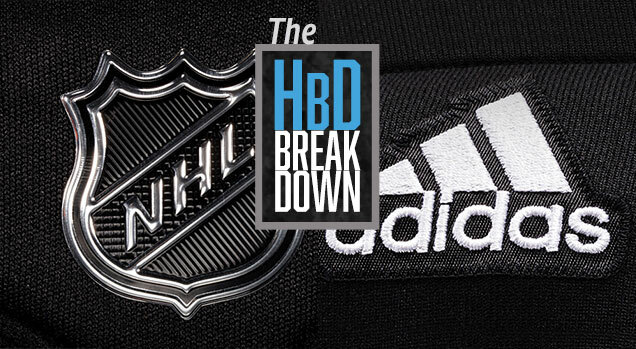 Tuesday was Christmas around these parts…all 31 teams in the NHL and got new jerseys. Well, some are more new than others. 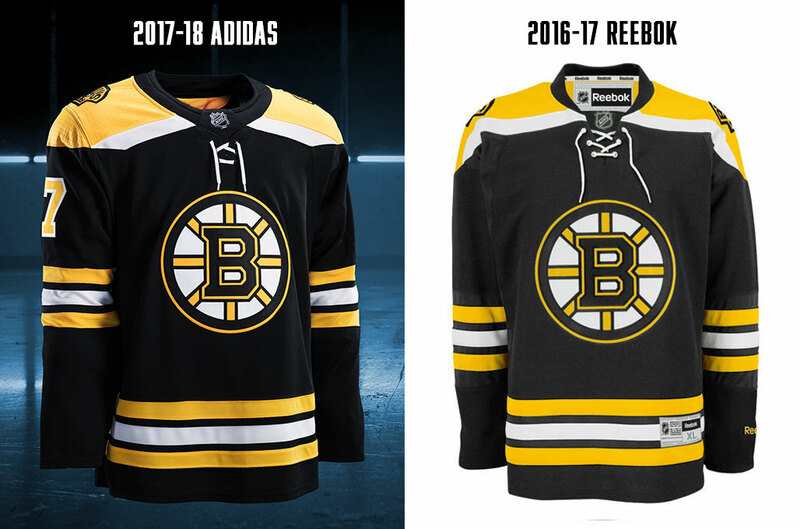 With the switch from Reebok to Adidas for the 2017-18 season, the new uniform manufacturer unveiled what each team will be wearing next year on their home rinks. There are a tons of changes made to the materials of the jerseys, to improve aerodynamics, breathability, and a whole host of other things that are meant to improve the experience for the players. As fans (and design lovers), we won’t really get to experience all those improvements, but we do get to experience a new look for everyone. 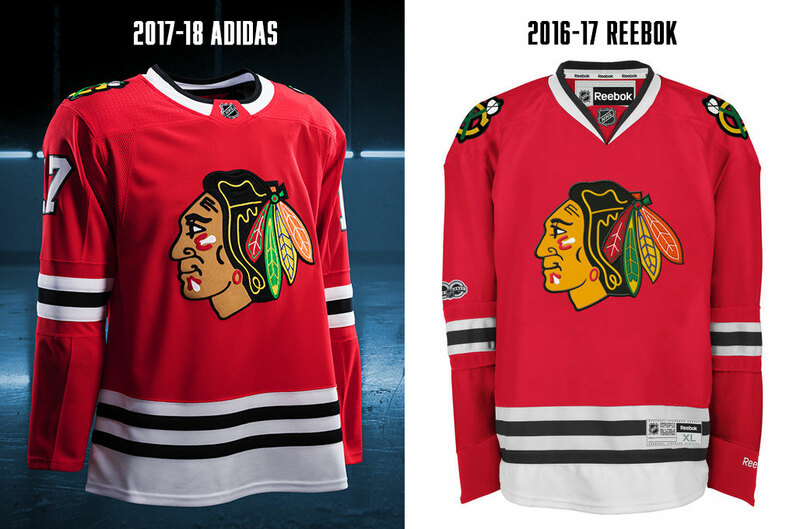 For each team, we’ll show a before-and-after photo of the jerseys (before images via NHL Shop, after via Adidas), go through a quick list of the changes, and make a quick assessment as to whether it’s an improvement or not. More dramatic changes (see: Wild) and the G’Knights with their inaugural jerseys, will also get their own posts in due order. For all the team’s jerseys, there are some changes. First, there’s a dot pattern on the shoulder yokes that are more noticeable on some jerseys than the others, depending on the jersey’s primary colours. It’s meant to improve fabric breathability, but it also adds some subtle texture and depth to the aesthetics of the jersey without being ostentatious. For me, it’s a thumbs up. Second, the collars have gone through a dramatic shift. Simply put, it’s now tailored more as a crew-neck rather than a v-neck. And a very wide crew-neck at that, similar to what Adidas created for the World Cup of Hockey jerseys last summer. 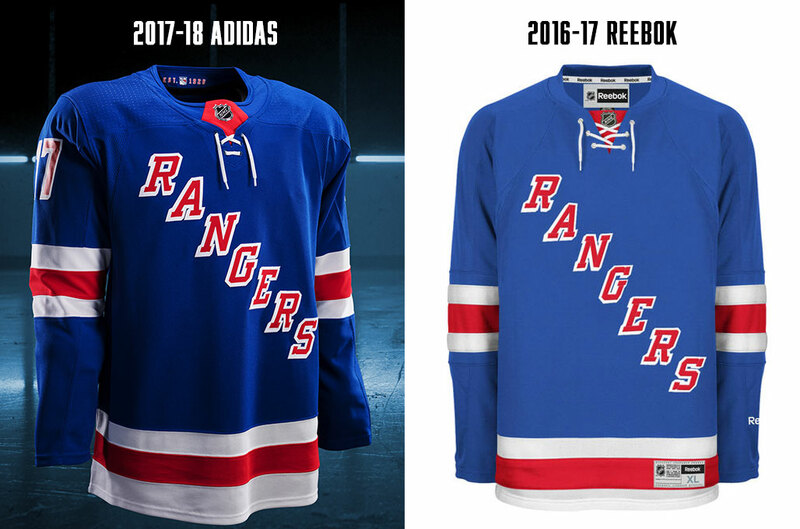 So, they’re playing a much more prominent role in some jerseys, and it’s also forced some changes for teams who wanted to keep the traditional laced collar. Some are good, some are alright, and some are bad. We’ll tackle those on a case-by-case basis going forward. What I don’t like though is how the hemlines seems to try to fake a v-neck. Just be a v-neck or be a crew-neck. Don’t try to be both. If you try to please everybody, you’ll please nobody. 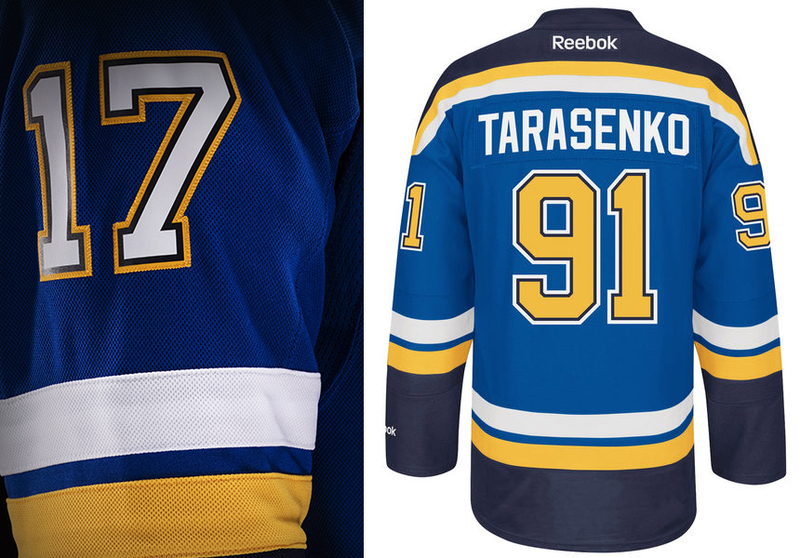 A lot of the collars also use a half-collar, or a different colour just on the backs/sides of the jersey. From some angles (like on the images below), it looks okay. From other angles (like here), it looks like a badly-tailored dress shirt collar. But, they also had them during the World Cup of Hockey, and it didn’t really bother me too much on most of the jerseys then. Again, it’s a case-by-case thing. Third, the shoulder patches have become more like shoulder-neck patches, moving much closer to the collar than they were before. For the most part, it’s not a big shift and doesn’t alter the jerseys dramatically. Okay, let’s get started with the teams, in alphabetical order. One of the worst jerseys in the league remains one of the worst jerseys in the league. There’s little that has changed here, with irregular, inconsistent, and gratuitous striping dominating the jersey…mixed with a simple and elegant orange-outlined shoulder yoke. It’s a bizarre combination. And orange and beige still don’t look good together. 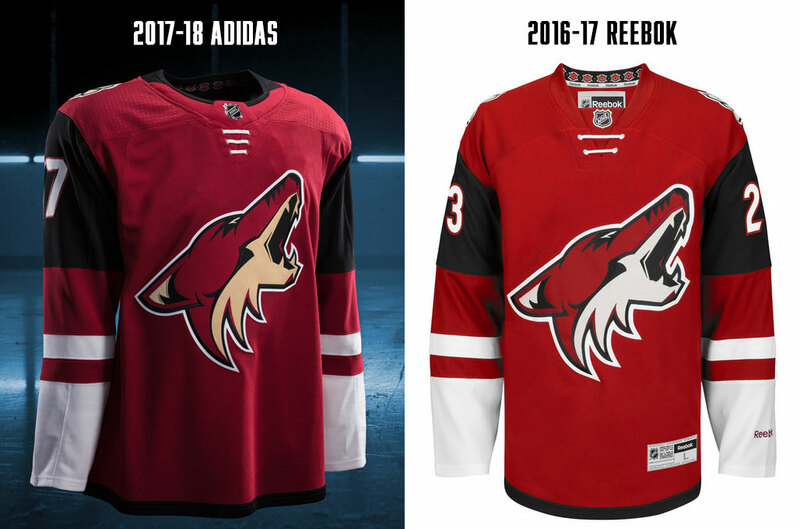 This is one jersey though where the new collar is an improvement, simplifying the multiple-outlined Reebok version to a thin beige outline to work better with the minimal shoulder yoke stripe. 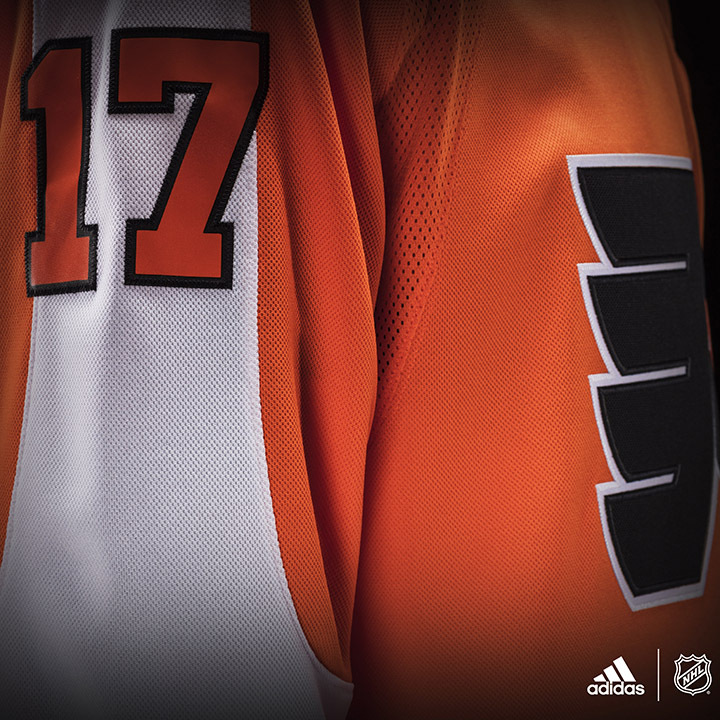 Not crazy about the orange half-collar around the back of the jersey, but this jersey’s always been a mess anyway. The collar, however, does show the awkwardness of the having laces on a crew-neck jersey, as they just kind of sit there. 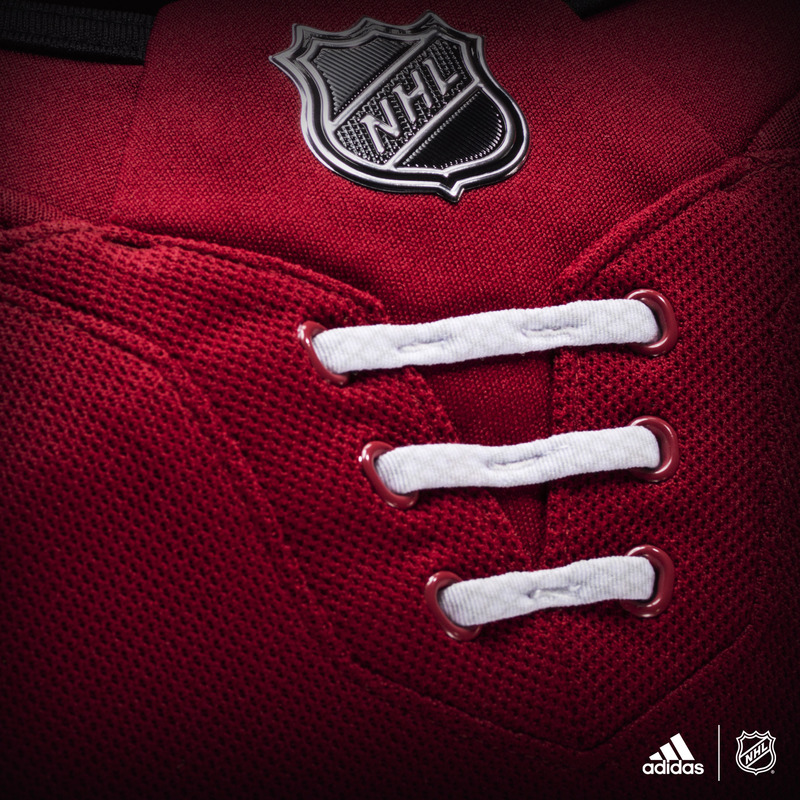 For a jersey that has a non-traditional design, laces don’t really serve a purpose, aesthetically or functionally. From now on, we’ll just call them the quasi-laces. Not fake laces, because that’s been claimed by something else. But the textured shoulder yoke does work well here to break up the black, especially with the natural orange-stripe separator. No major changes here, the same design on a new template. Same quasi-laces on the collar on a faked v-neck hemline. The addition of black to the collar (and the black half-collar) works fine with the general chunkiness of the jersey design overall. 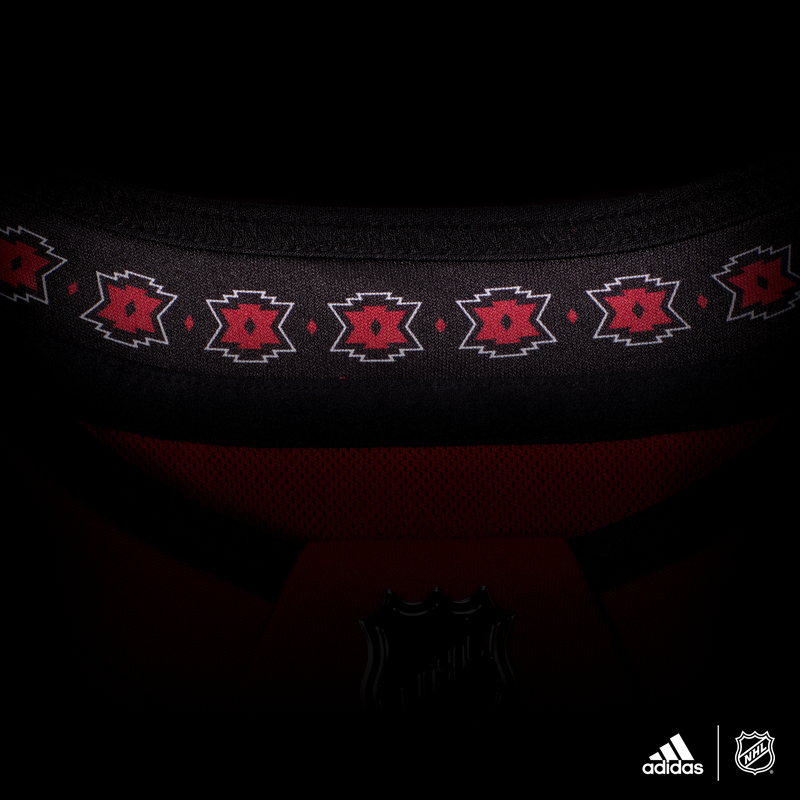 The kachina-inspired inner neckline is carried over as well, and rightfully so. Improved? No. But didn’t get worse either. 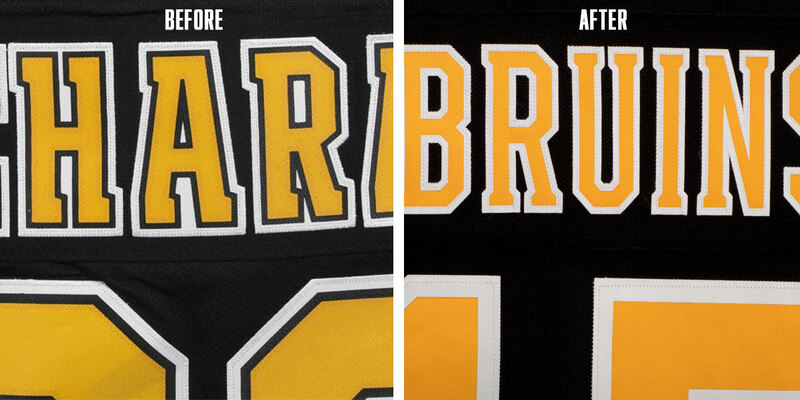 The only real change is on the back, where they’ve removed the extra black outline around the numbers and names. (Click here to see.) This is definitely a welcome change as it adds more simplicity to an already superb jersey while also being more in line with their historic jersey designs. The one peculiar thing is the shoulder caps, where the yellow/gold is being cut off much higher than before. It looks a bit awkward but nothing hugely detrimental. The larger black collar actually blends in a bit better with the jersey overall than their previous jerseys and while their quasi-laces are essentially useless, at least it has a historic look going for it. No more grey armpits! No more grey piping! 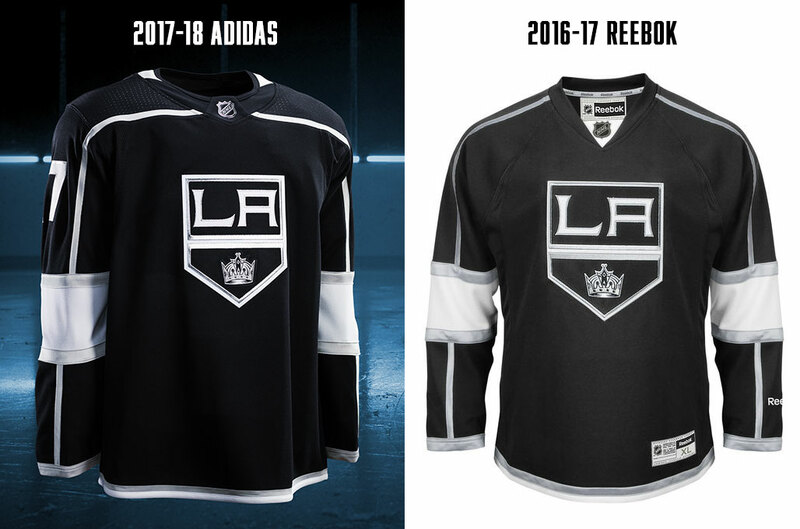 But there’s still a lot of superfluous grey here, needlessly surrounding outlining every inch of the logo as well as the extra grey stripes on the sleeves and bottoms. 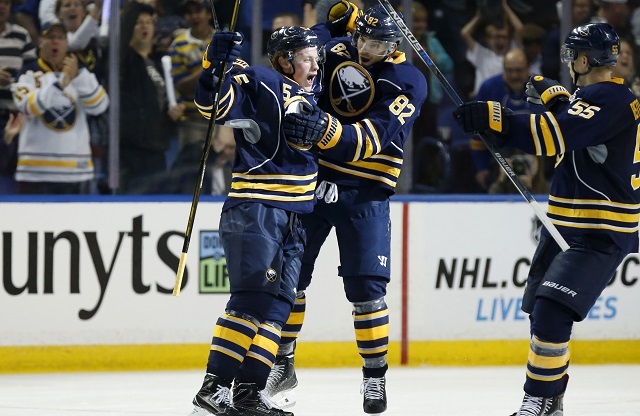 And where’s the royal blue every Sabres fan was clamouring for? 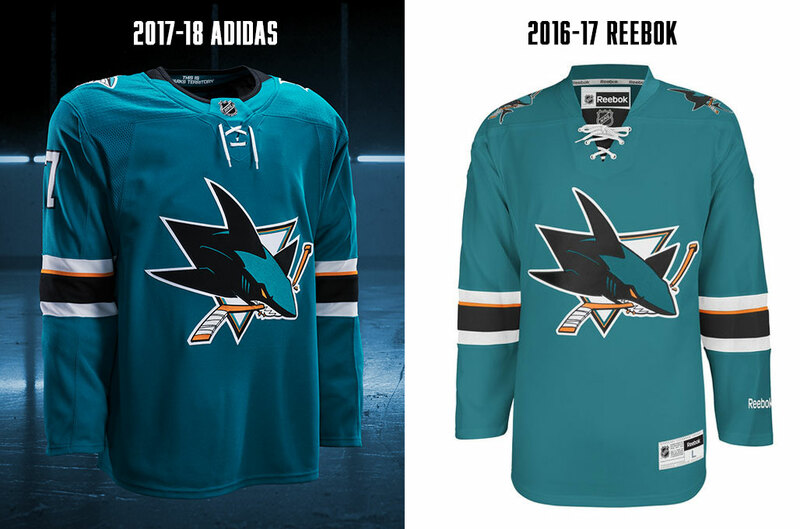 As for the collar, they tried to transform the previous jersey’s grey triangle at the collar into the new design without considering the fact that it looks weird af on a crew-neck, especially when matched with the useless quasi-laces. 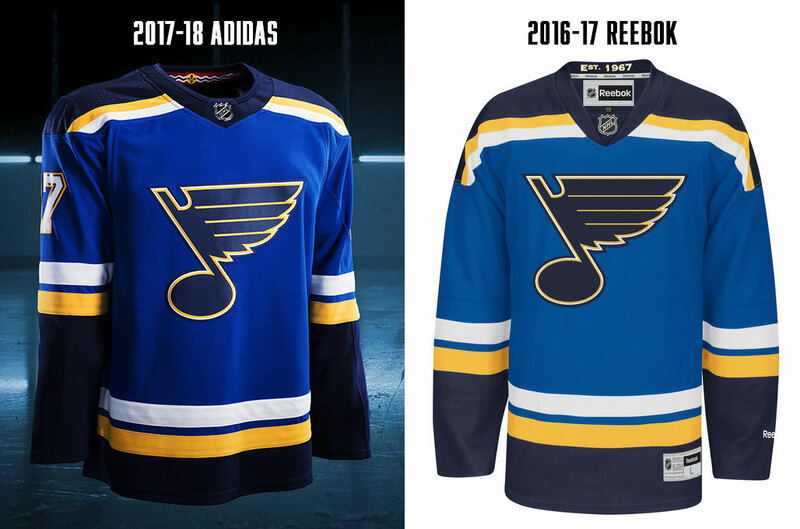 At least, if you’re going to do that, make the entire collar yellow so that the contrast between the white key-shape against the navy blue doesn’t make it stick out so much. Improved? 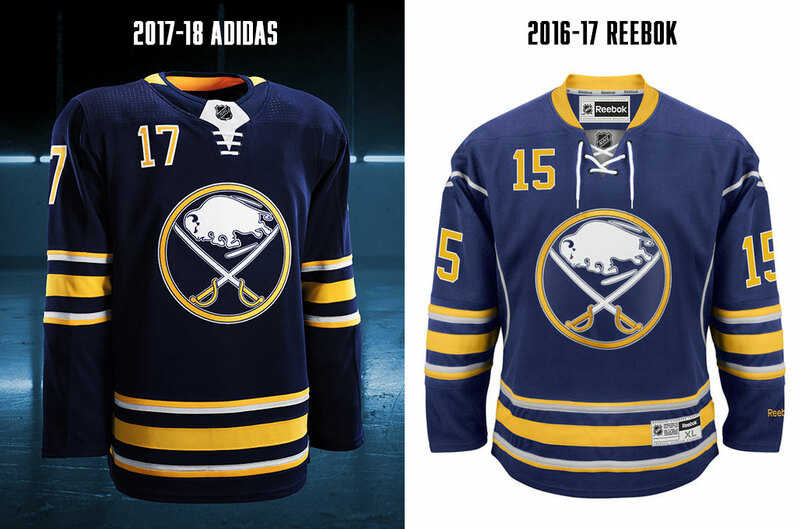 You take the good, you take the bad, you take them both and there you have the new Sabres jersey. Most are calling Calgary one of the losers for not going back to their vintage look full-time. I’m still calling them winners because they improved their jerseys, although not by much. They basically got ride of their stupidest feature: the going-nowhere armpit-outlining black things. It was hard to see, but it does look like they kept their side striping, but the bottom white/yellow stripes seem to not get blocked by them anymore. But the flag patches? 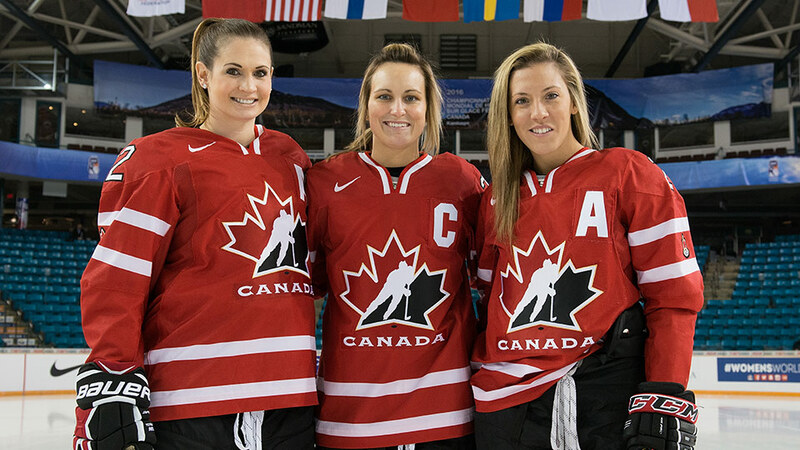 C’mon, you’re neither Alberta’s nor Canada’s team, and the blue Alberta flag sticks out badly on a red jersey. The collar works fine for what it is. The thin-to-thick black works with the rest of the jersey, including the quasi-laces. Improved? Yes, a bit. Still needs work though. This is one of the larger changes, and it’s essentially the love-child of their previous jerseys and their original jerseys. The huge leap they made toward minimalism with their recent jerseys has been scaled back a bit, but not to the tacky and over-complicated point that they were before. No superfluous grey striping, no shoulder yokes, but yes to the hurricane-themed waist stripe, extra striping, as well as bringing back a ton of black. If they wear red pants with them, great. If black pants, not so much. 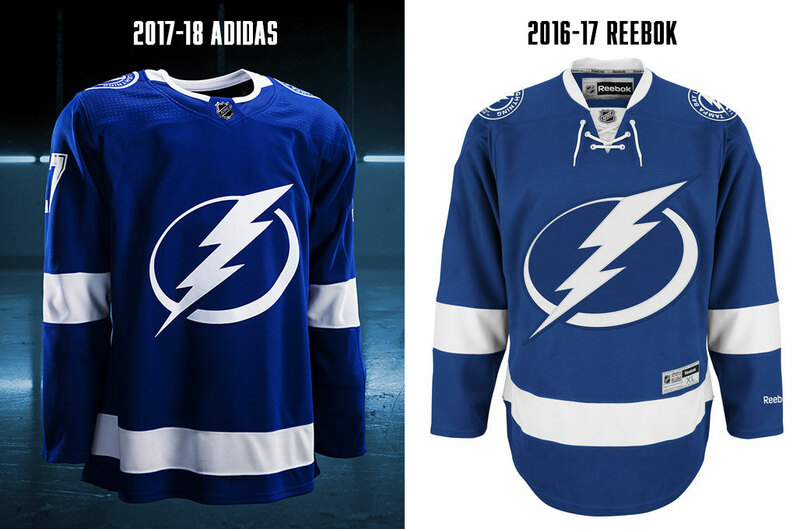 The hurricane-stripe works way better here, because it seems the good people at Adidas are readers of this site. 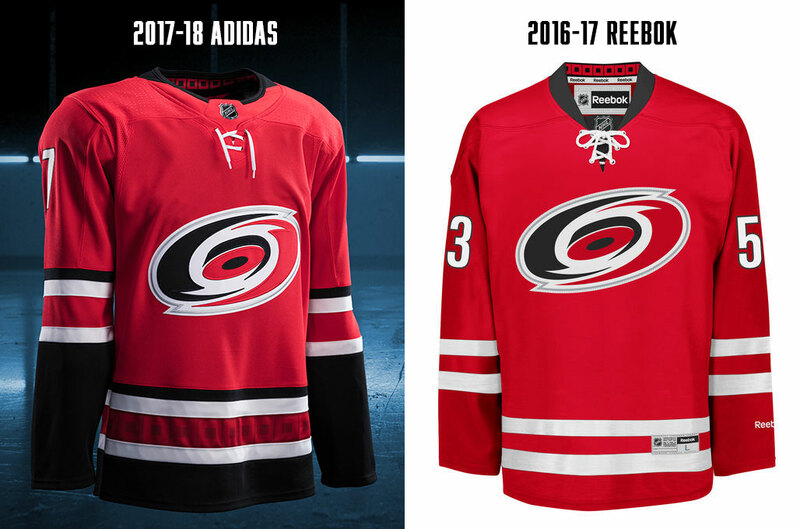 On our Hurricanes’ Worst to First Jerseys post, I opined about how it would work better if it was more subtle, and that’s exactly what they did. And as expected, it works way better. Less obnoxious, less demanding of attention. It they added it to the sleeve stripe as well it probably would’ve worked. The collar actually works better than on their previous jersey as there’s more black to balance it out. These quasi-laces seem to have lace-ends poking out, which is even weirder considering how useless they are. 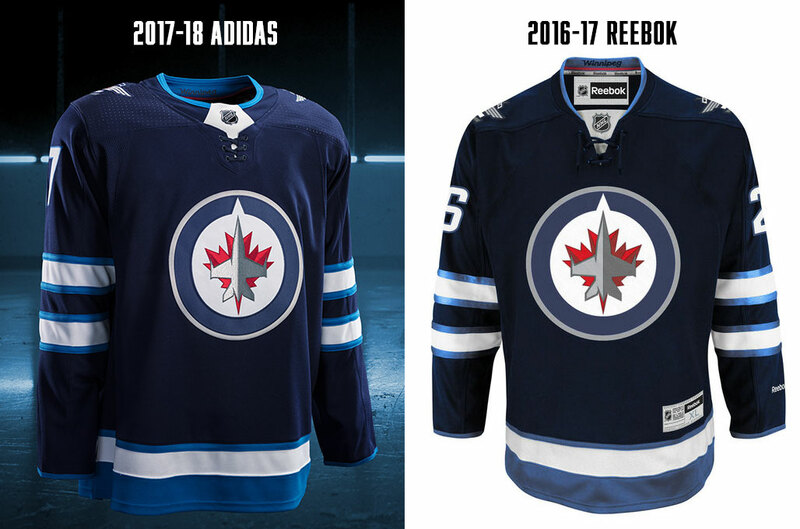 While the previous jerseys were accused of ripping off the Canadian teams, these new ones are much more distinctive for Carolina and closer to their glory days. I’m usually a fan of more minimalism, but these are justified to move away from that and approached it well. Improved? Yes, absolutely. One of the primary winners of the unveiling. No changes to note. Even the collar is as similar as they could get it to the previous version. And the first jersey without quasi-laces! Improved? No, but it’s hard to improve on greatness, so kudos to them for not trying. Another one of the bigger changes of the day, Colorado also steps back into their jersey history a bit, returning to the angled mountain-esque striping of their original jerseys. 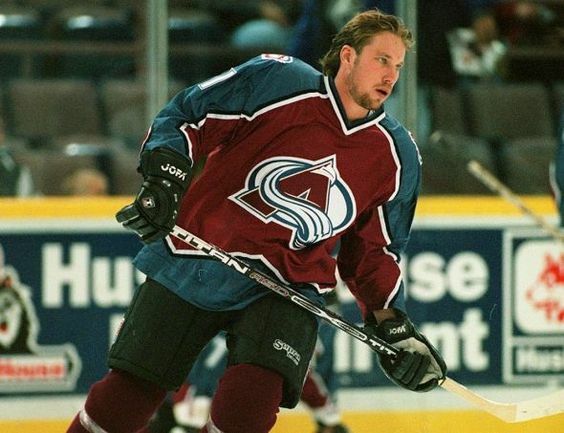 It’s one of the few jersey experiments from the ’90s that actually worked well, creating something distinctive and relevant for the Avs. All hail its return! For me, they’ve actually improved on the original jerseys here by including only one outline on the angled areas of blue, simplifying the original design while maintaining its distinctive nature. 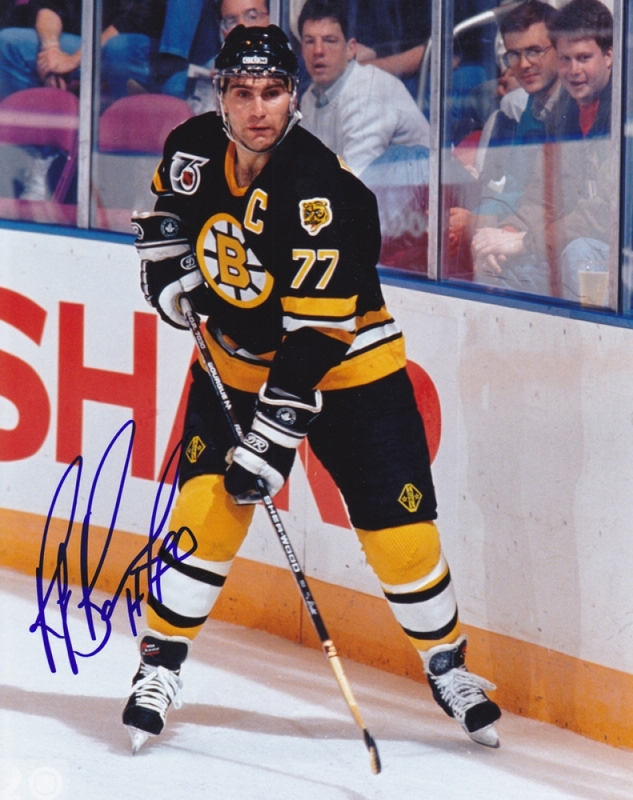 Gone (thankfully) is the Reebok-era piping, which was awful but also looked super awkward with the captaincy letters. 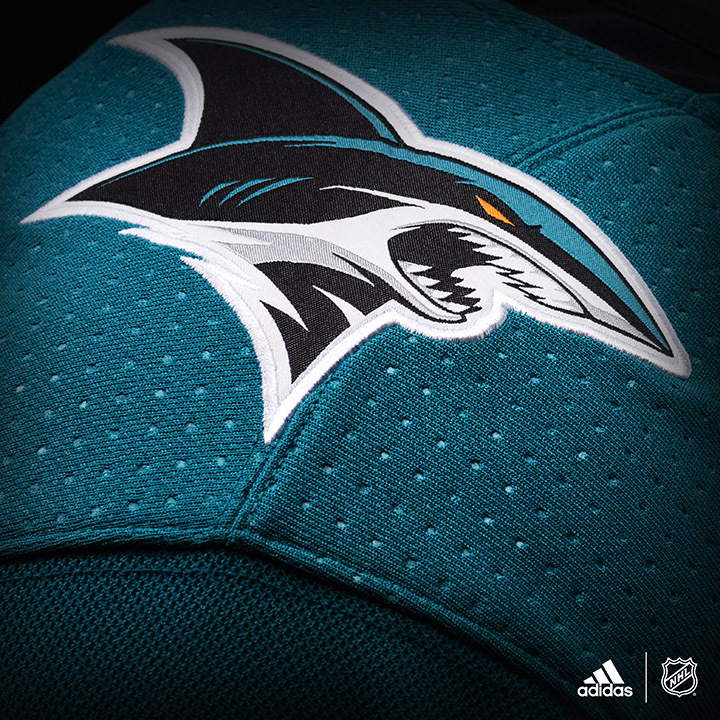 The collar could definitely do without the extra grey half-stripe on the back. 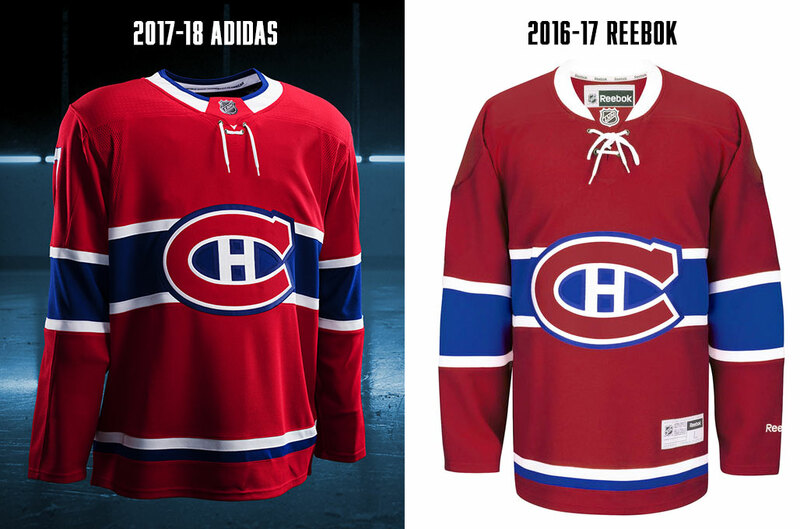 I’m also not crazy about the extra burgundy behind the NHL logo, but not nearly enough to be detrimental to the jersey overall. Improved? Yes, absolutely. Another one of the primary winners of the unveiling. The hole pattern in the numbers are a nice addition to add a subtle texture to a predominantly navy blue jersey. Improved? Yes. The consistent typography is definitely better. 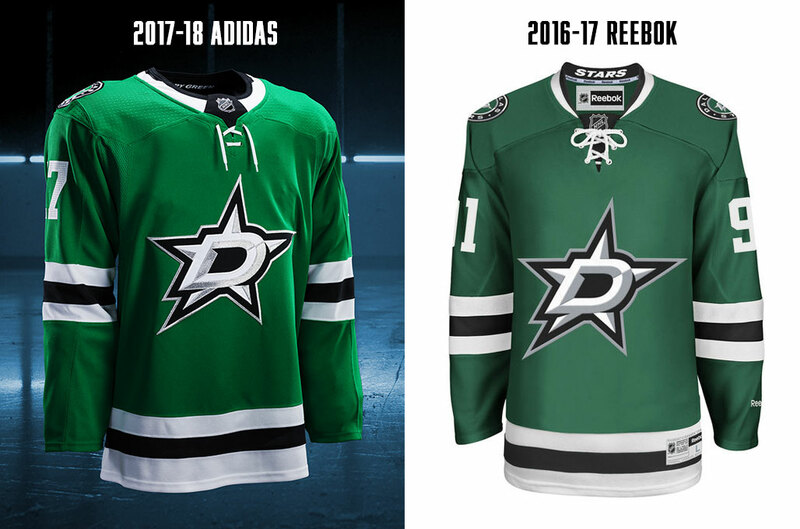 No major changes at all, which is not surprising since this is already a great jersey that just came out a couple years ago (see our recent Dallas Stars Worst to First Jerseys post for details). The quasi-laces are carried over (which are still strange from their lack of any function whatsoever), and the black key-shape on the collar works here too. Improved? Not necessarily, but it’s still a great jersey. You think they’d touch this thing? Haha, no way. It’s pretty much as exactly the same as it could possibly be. 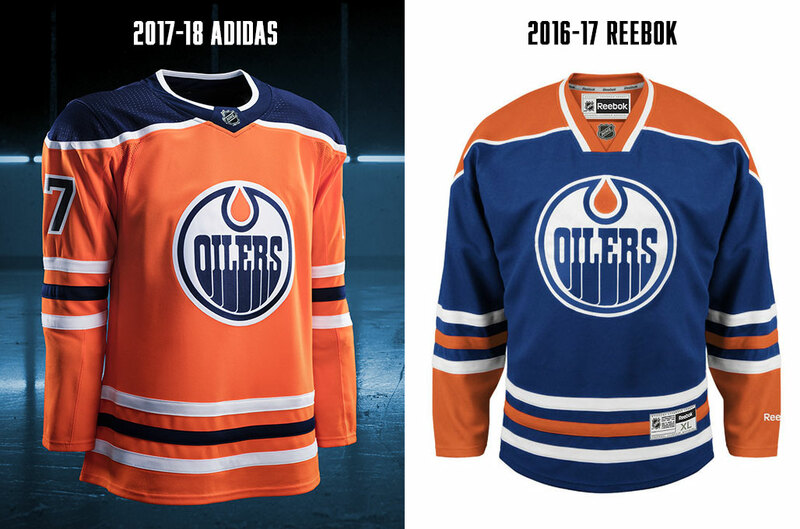 We all knew that the Oilers were ditching their home blues in favour of their new orange alternates. We even knew that the blue was going to go navy. But, we didn’t know the orange was being de-intensified to more of a peach colour. 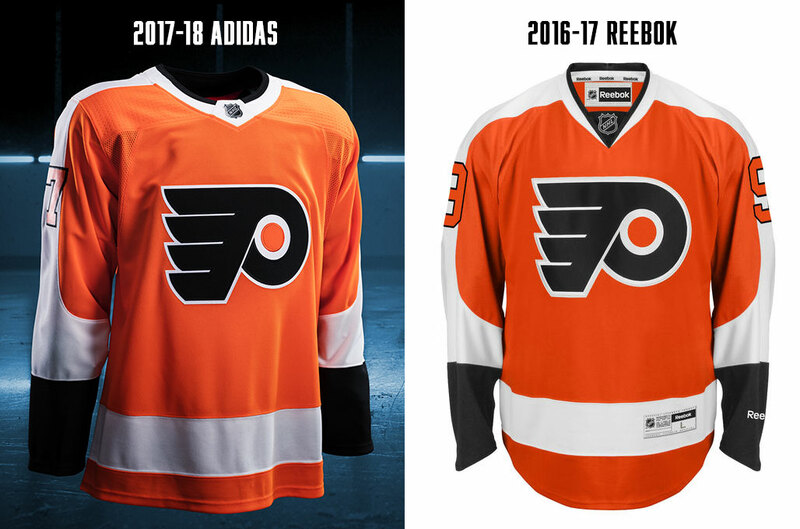 And we didn’t know that they were bringing over essentially the same design from their blue jerseys than their orange alternate, with three stripes kept separated rather than connected. 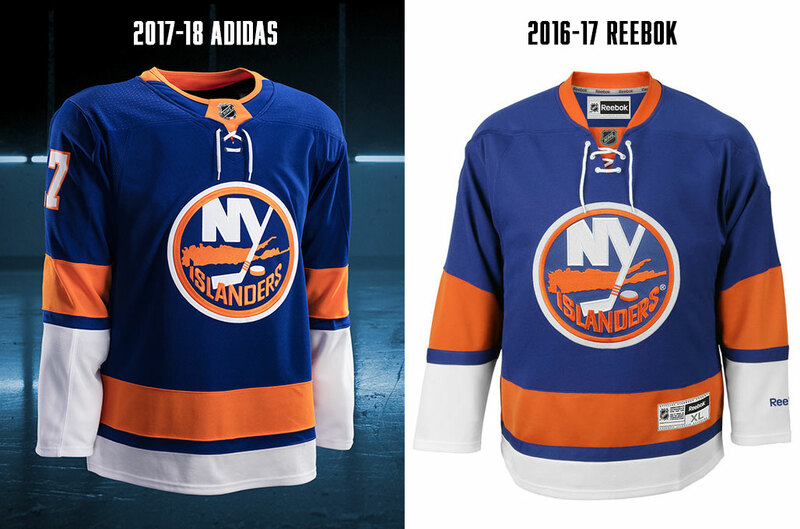 It all makes for a lesser jersey than either their blue or orange ones from last year. I’m all for orange jerseys, but the subtle change of colours makes them both look drab, taking all the potential energy and intensity out of them. The white stripes mixed with the darker navy blue also creates way too much contrast, drawing the eye right to the bottom of the jersey, especially with two white stripes and one blue. The numbers are also moved from the shoulders to the sleeves. Basically, they removed everything that made the orange jerseys great and replaced it with a frankenjersey of elements that don’t work together from both of their jerseys from last year. The collar/shoulder yoke mixture is really nice though. So, there’s that. Improved? Not at all. This is a downgrade for the Oilers. No major changes, which is not surprising considering they just did a full visual re-brand last year to a generally good reception. And glad to see they kept this style of (quasi-)lacing, referencing the Florida flag. Also, the only team to keep their numbers on the shoulders. No changes, aside from adding in a half-grey collar…which doesn’t really work. Improved? No – a tiny, imperceptible, almost invisible step down. 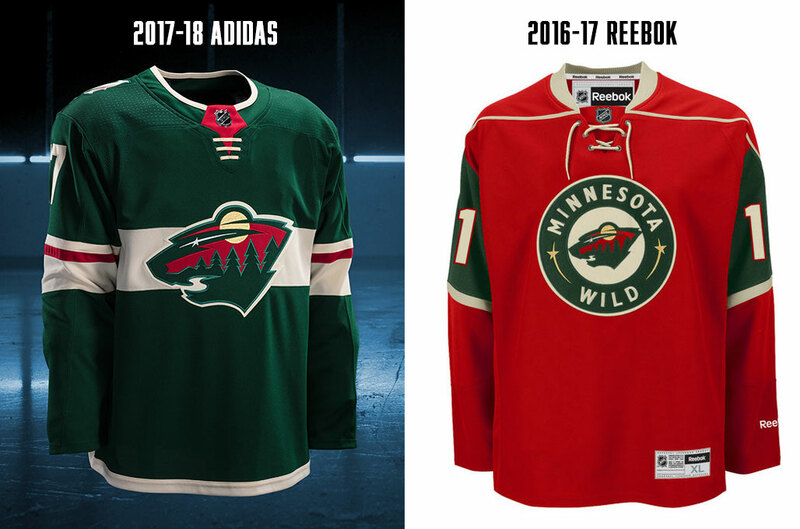 The only team to get a full and major re-design is the Wild, which has a jersey set that was all kinds of awesome and all kinds of inconsistent. We’ll give it a full breakdown with the full post that it deserves. But as a quick analysis: these are great. 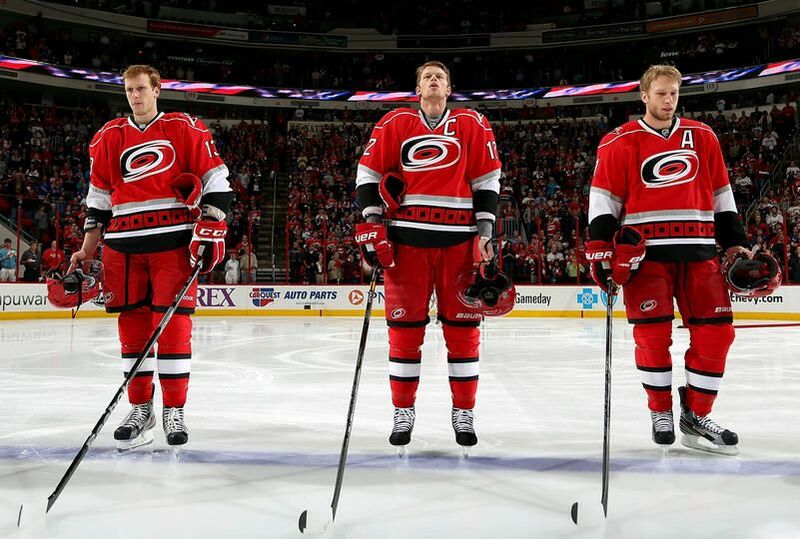 Their previous jerseys either had too much red in them (or not enough) to reflect the full palette of the brand. These new jerseys give have a more proper balance while also approaching a more modern aesthetic that’s still firmly rooted in hockey’s roots. Improved? Yes, definitely. Their previous jerseys were fantastic, but so are these and they’re projecting a more consistent aesthetic. Another big winner from the unveiling. If you thought these were going to substantially change at all, you’re crazy. But there is a small change: a thin blue stripe has been added to the collar. Sorry purists, but I think it works. Improved? Yes – a tiny, imperceptible, almost invisible step up. These were the first jerseys to leak on Tuesday, and luckily it didn’t set the tone for the rest of the jerseys because these are easily the biggest losers of the unveiling. Gone is almost everything that gave this jersey its uniqueness, personality and dynamism. And they replaced it with…nothing. I know the Reebok-era piping was generally reviled (and with good reason), but I’m on record as saying that Nashville had one of the most under-valued and under-appreciated jersey sets in the league, and they were the only ones that made the piping work well. The thin white line was simple and consistent throughout the jersey and the addition of the blue wedges the collar balanced all that gold. These new ones? They’re practice jerseys with some navy blue at the bottom. Boring, devoid of personality, too much gold. 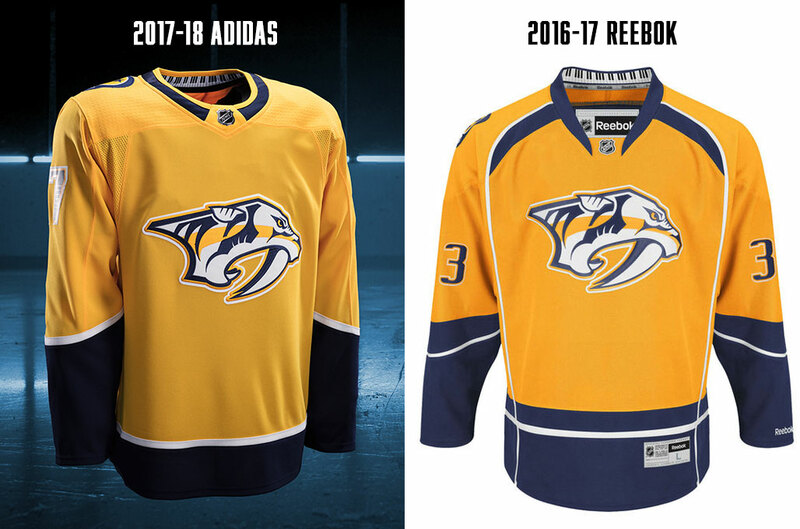 Puck Daddy had an article about these jerseys in which Adidas stated the jerseys were “accentuating and celebrating what [the Preds] are all about”. We all saw in the Cup Finals what Nashville and the Preds are all about: energy, excitement, charisma, dynamism, celebration. And none of that exists here. At all. Even the collar looks more like a choker necklace than a proper collar. The only positive is that they kept the keyboard on the inside of the collar, which is generally never going to be seen. Improved? Nope, a colossal Niagara Falls-sized drop. From one of the best in the league to one of the worst. 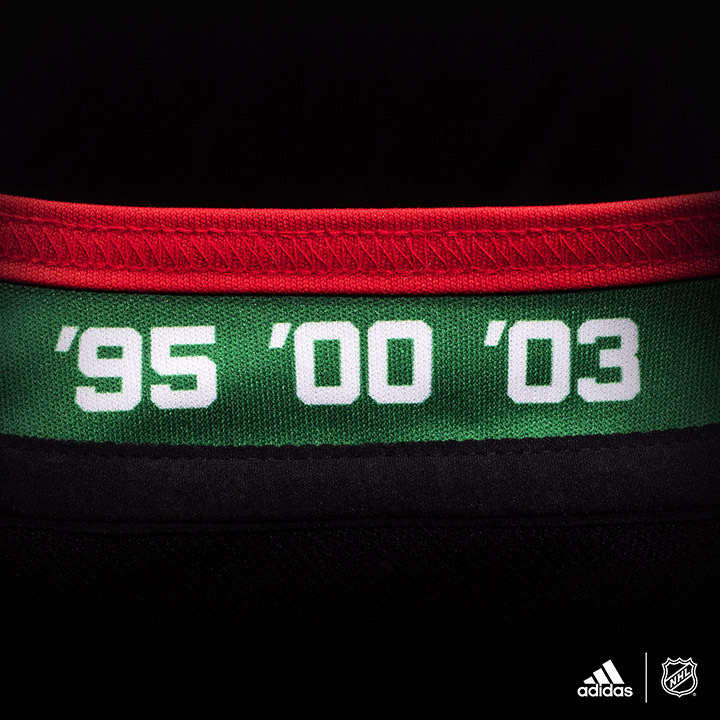 The Devils – for one of the few times in their history – get a major jersey re-design. While there were lots of expectations (hopes?) to see a return of the green-and-red color palette, the red-and-black remained (except for the collar). The interesting thing is that the only major change is the removal of the stripes around the waist in favour of a single black stripe along the bottom, but it makes a big difference. For me, the Devils had the most stereotypical classic hockey jersey. You could take this jersey, change the black and red to any other two colours, slap a new logo on it, and it would work. 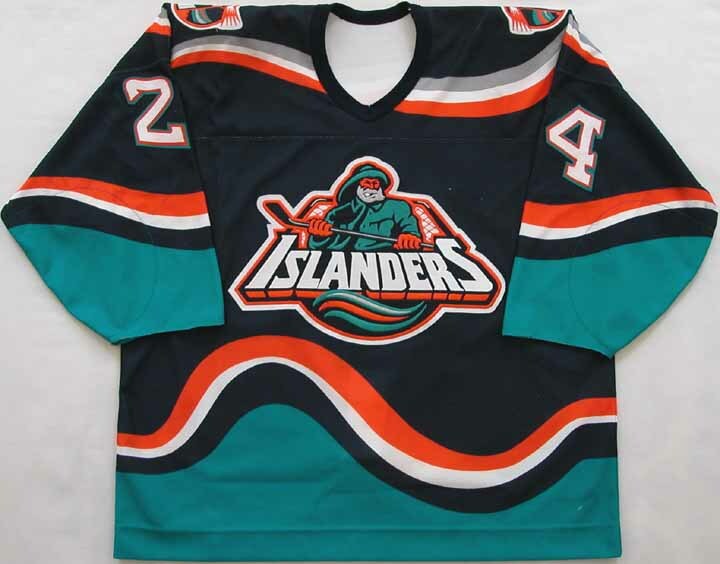 If there was a (figurative) blue-collar hockey jersey, this was it. No nonsense, got the job done. And with the removal of the waist stripe, it’s not that at all anymore. 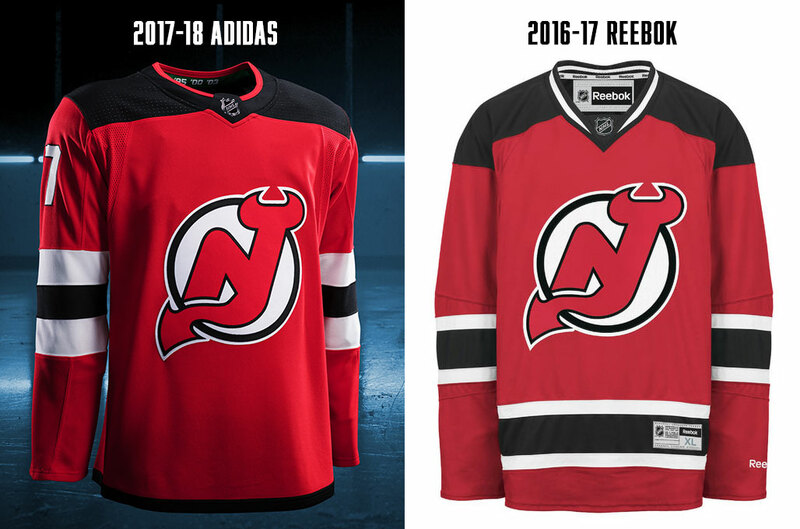 And that seems to be the most shocking aspect of this jersey: intentionally or not, it visually changes the Devils brand and ethos. A lot of their changes are rooted in the history of the franchise (including references to it’s time in Denver and Kansas City) which I really like, but there’s an undeniable modern and minimalist trend for this new design that doesn’t quite feel in sync with its symbolism. Basically, a nondescript jersey just got descript. And it’s throwing everyone off, myself included. Hooray! The Islanders didn’t do anything stupid or crazy! That’s a win right there. 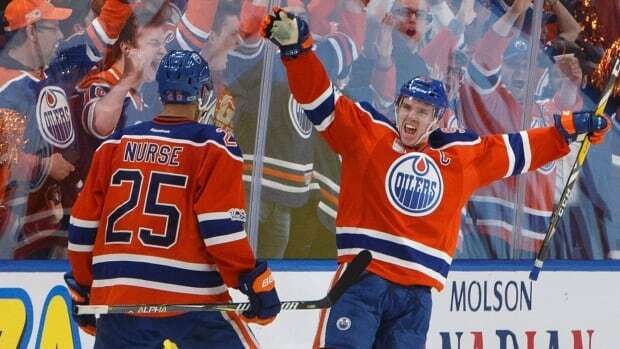 But really, they didn’t really do anything, aside from adding some blue to the collar via a half-collared orange. And the quasi-lacing of course. Improved? No, but there’s absolutely nothing wrong with that. It would be blasphemous to alter the Blueshirts’ blue shirts. The only quirk is the red key shape at the collar. 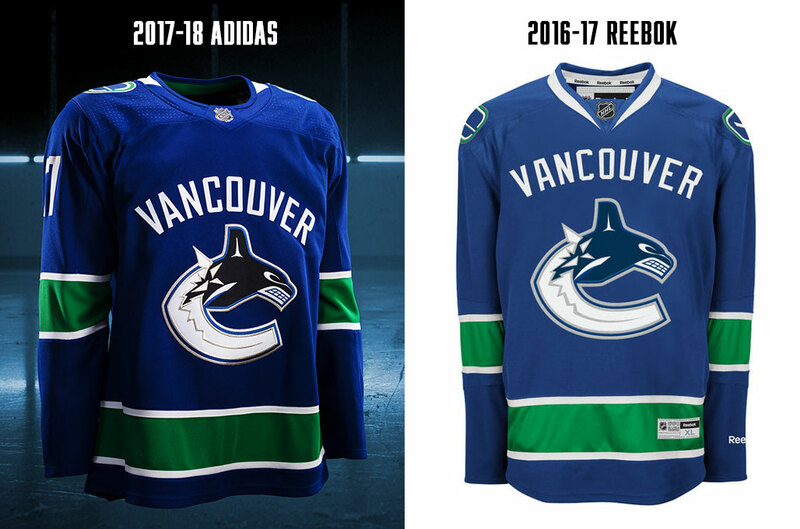 It would’ve been better to just go with history and keep the whole collar blue. Improved? No, a very minor step down. This one is frustrating. The last holdouts of the strange (and boring) sleeve/side blotches of colour that were introduced by the Reebok Edge jerseys had a chance to upgrade their jerseys, and they had an amazing third jersey staring them right in the face. Instead, they doubled-down on their same design, but somehow made it even more boring by turning the organic shapes in blocks. They had other (and better) jerseys. Right there. In front of them. They’ve worn them before. They could’ve had class. They could’ve been someone. They’ve could’ve been a contender. Instead, we’re stuck with these for an indiscriminate amount of time. The collar? Whatever. It’s black and boring. No changes at all. And although it looks like it on the image, they didn’t change the colour of the numbers. 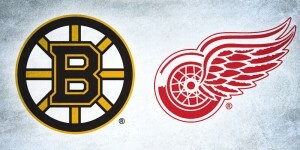 And good call on having changing the NHL logo background on white rather than black. Improved? Sure, better, just for the collar change. 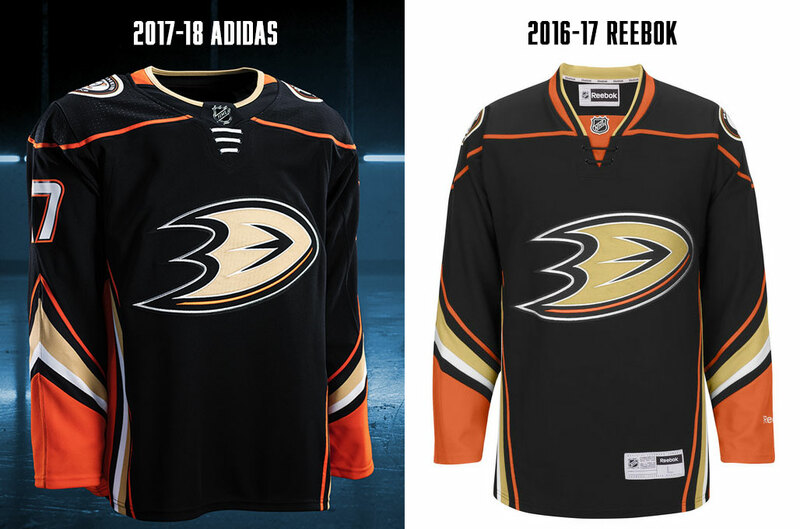 Not surprisingly, the Cup champs make almost no changes this summer after just making their old jersey set new again last summer. The only change? A yellow half-collar. Personally, not a fan of that as the high contrast between the gold and black draws too much attention there. Improved? Nope, worse, just for the collar change. Two small changes. The secondary logos they introduced last year become the new shoulder patches. And black is added to the collar, which is probably a good thing. The uber-mimalist approach needed something to balance all that teal. Improved? Sure, a small amount. The only major change with these jerseys is the colour change of the jersey numbers, from yellow to white. On the one hand, it makes the numbers more consistent with the players names. On the other hand, Blues fans seem to really like their yellow numbers, judging by the anti-white-number rage on Twitter. But it also decreases the amount of gold on the jersey, which is also a sad thing. 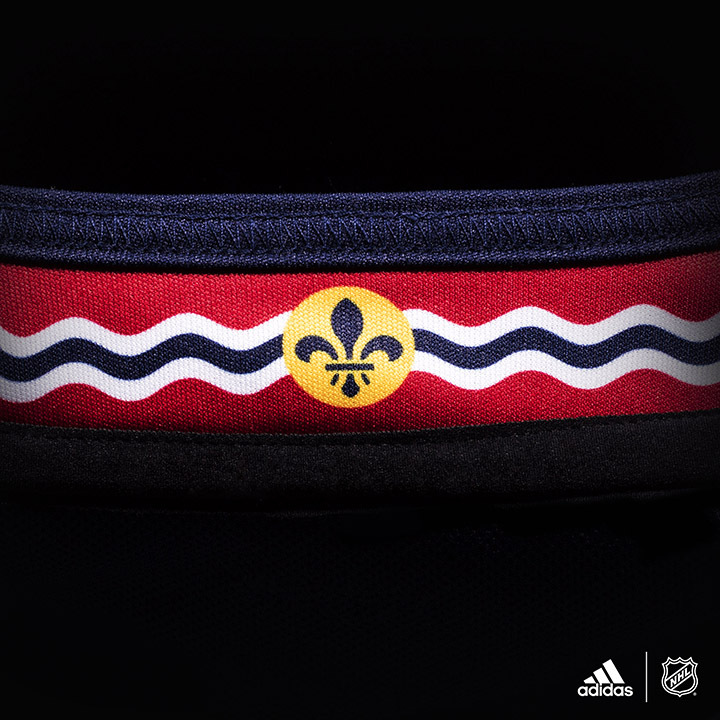 The really nice inclusion is the collar detail referencing the amazing St Louis city flag. Given how long St Louis strayed through hockey-jersey-Siberia with a mishmash of attempts, it’s nice to see them hit on something great and stick with it. And yes, I’m glad they didn’t revert to their Winter Classic jerseys (which are awesome, but they need to give this look some time too). Improved? 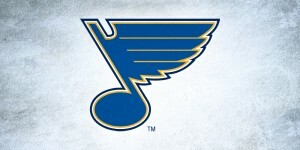 Let’s side with Blues fans on this one and go with a slight “no”. Nothing to see here. Let’s move along. Well, there is the addition of the white half-collar. Or the subtraction of white with a half-collar? Either way, I would’ve preferred a full-colored collar. On the plus side…no quasi-laces! Improved? Uh, sure. Why not. 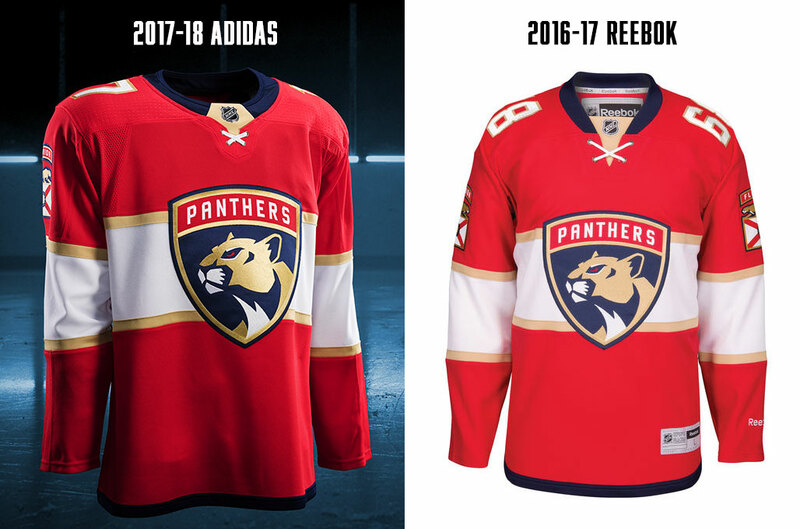 Like Florida, given the very recent jersey changes they made, it was unlikely that anything would change this time around, and as expected, not much changed. They did do the same as Tampa though and add (subtract?) a white half-collar. Geeez Toronto…always copying Tampa with your jerseys. Improved? No, but that’s okay. The only change is to the collar, where the thin white stripe is replaced by a white half-collar. Should’ve just gone with a full white collar or none at all. Improved? Nah, a very minor step down. Sorry, but these are going to rightfully get their own full breakdown in a separate post coming soon. It may not be pretty. So, stay tuned! Pretty much nothing changed here at all…even the collar is pretty much the same. Improved? Nope. But not worse either. And finally, Winnipeg, which had no changes to speak of. Still not sold on that key-shaped collar thing though. Nice rundown. I actually agree with 95% of what you’ve said here, which is shocking 🙂 The only differing (and apparently unpopular) opinion I have is on Nashville. I was never a fan of the previous uniform design, and I think the simplicity of the new one balances what is one of the more complex logos in the league. 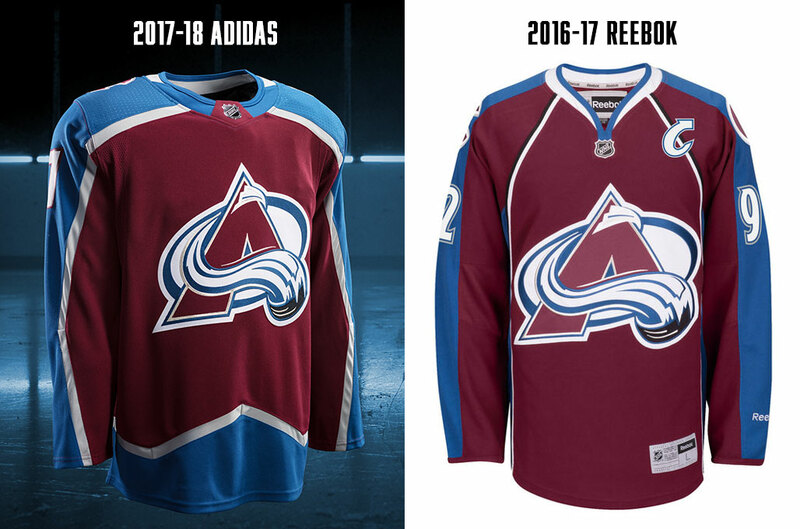 When everything is complex, it becomes overwhelming, so the more minimal look is preferable for me, which is also why I like the Avalanche’s new look. I do think Nashville could have used a blue yoke to balance the whole thing, but they’re all in on the gold, so I get why they didn’t want to take any gold away. I actually like the road version better, so maybe that will temper some of the hate when it comes out. Just a quick note about the Oilers; their new orange is more intense, not less intense. 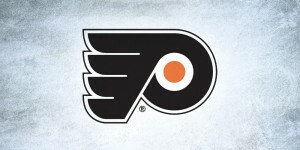 It’s now more like the Flyers’ orange as opposed to the classic burnt orange they’ve been wearing. Haha, we only agree 95% because I haven’t tackled Vegas yet! Thanks for your comments, and we’ll have to agree to disagree on Nashville. I understand the desired push towards minimalism, but I think the desire for more gold overshadowed everything else. That’s not necessarily on Adidas either, as I’ve heard (unconfirmed of course) that the Preds manangement/ownership would prefer as much gold as possible: hence the gold helmets and they even requested gold pants, gold everything. Any truth to those claims? Regardless, owning a colour is different that smacking people over the head with it. And good tip about the Oilers, thanks. The pictures don’t do it justice then and I’ll have to wait to see it on the ice or in person. 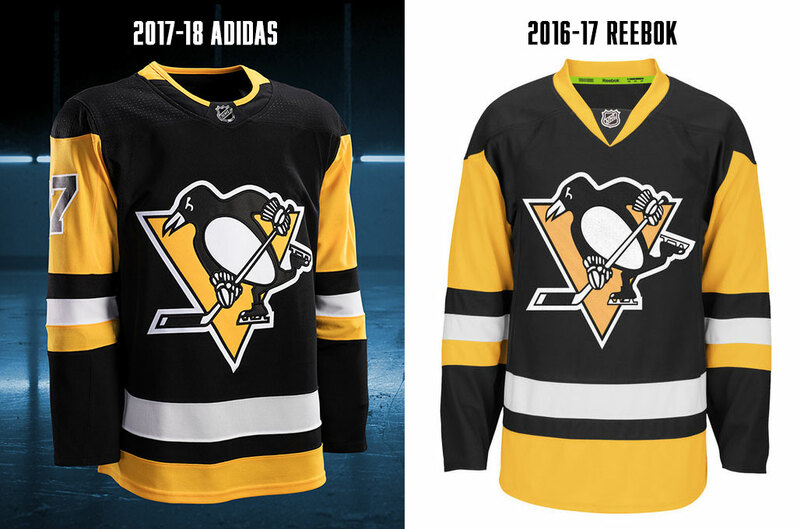 Also looks like Pittsburgh was the only comparison to depict an authentic Reebok jersey… other teams are all fashion replicas (branded ‘premier’, determined by the jock tag, bottom corner). Good catch, hadn’t noticed that about the Ducks. 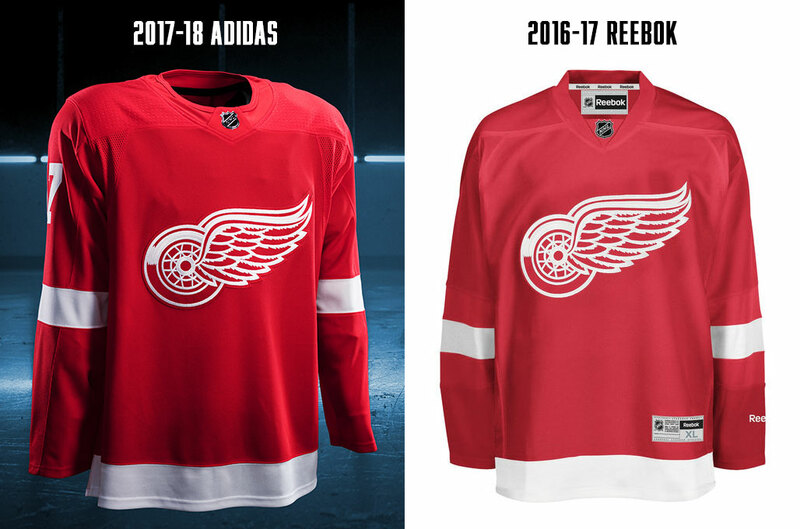 Regarding the Reebok images, they all came from shop.nhl.com to maintain an aesthetic consistency to them. They didn’t have many teams left selling the authentic Reebok jerseys that I could see, so I went with the closest alternate I could find, which were the fashion replicas. For the purposes of this post, they fit the bill well enough. Don’t know, they’re not on sale yet. 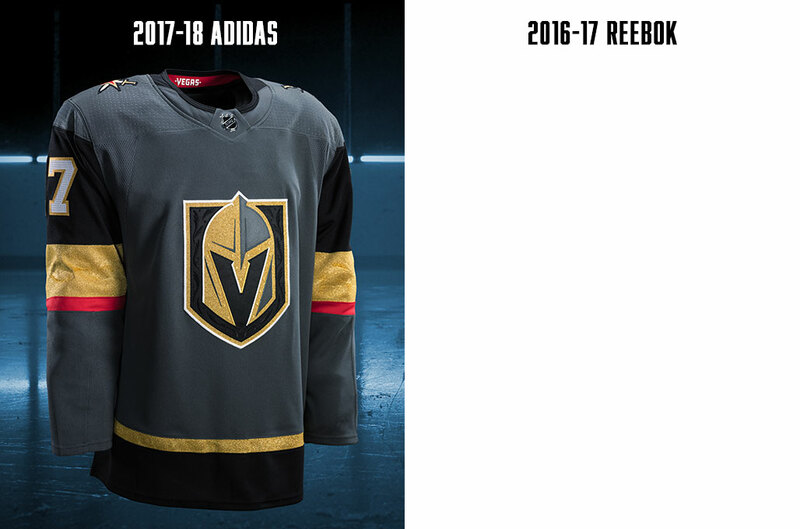 Am I the only person who really digs Vegas’ jerseys? I think they look really sharp, especially the homes. Yes, the logo is a bit generic, but it’s not that bad. I like the embellishments on the crest featured on the actual jersey. Good balance of colours, and the red stripe is totally necessary. It pops against the gold and black and ties in with the secondary logo. Without them, they would look much more dull. I’m actually considering picking one up, spoken as a Blues fan in Toronto! I feel like I’m one of the only people on the internet who feels this way. 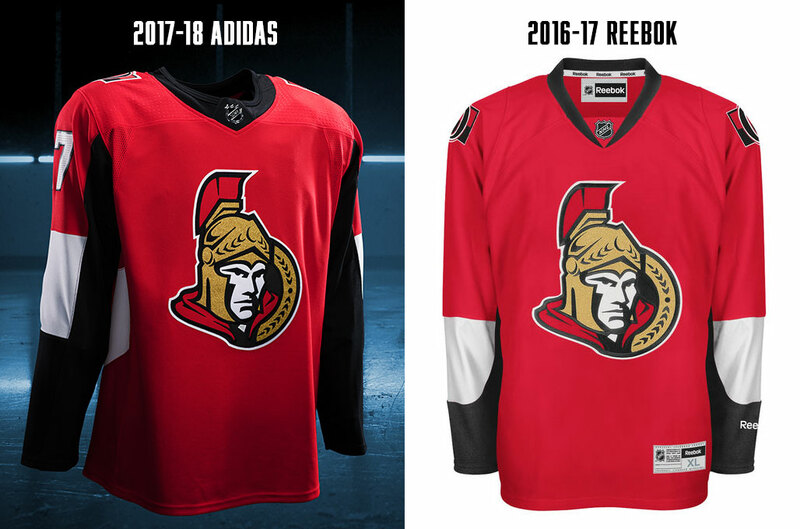 Losers: New Jersey, Nashville, Ottawa (seriously there are so many amazing concepts out there… Switch to the newer 2D Centurion already!) Anaheim, Calgary, Columbus and Washington are also teams that should have taken this opportunity for big changes and didn’t. Jury is still out on Edmonton, we’ll see. Seeing them in anything other than their beautiful throwbacks is going to be weird, but I’m not completely against these. I agree with most of what you said. Here’s a few of my opinions. I’m one of the few New Jersey Devils fans that actually likes the new jersey. 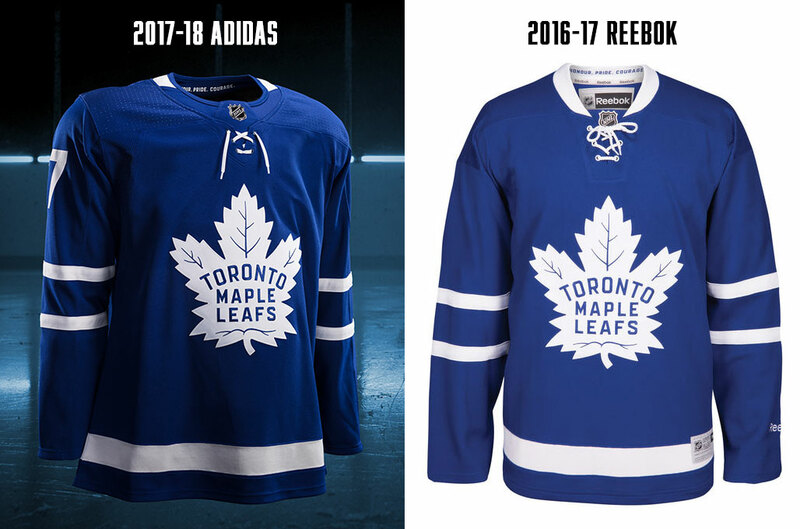 The old one was basically a 3 colour version of the Maple Leafs jersey before they changed the bottom strip to a chunk of white. It was time for a change. The only problem is it needs some white on the body. Maybe a white stripe on the shoulders similar to the the bruins or down the bottom above the black stripe? But other than that I really like it. Carolina & Colorado are definitely the biggest big improvements over their old ones. 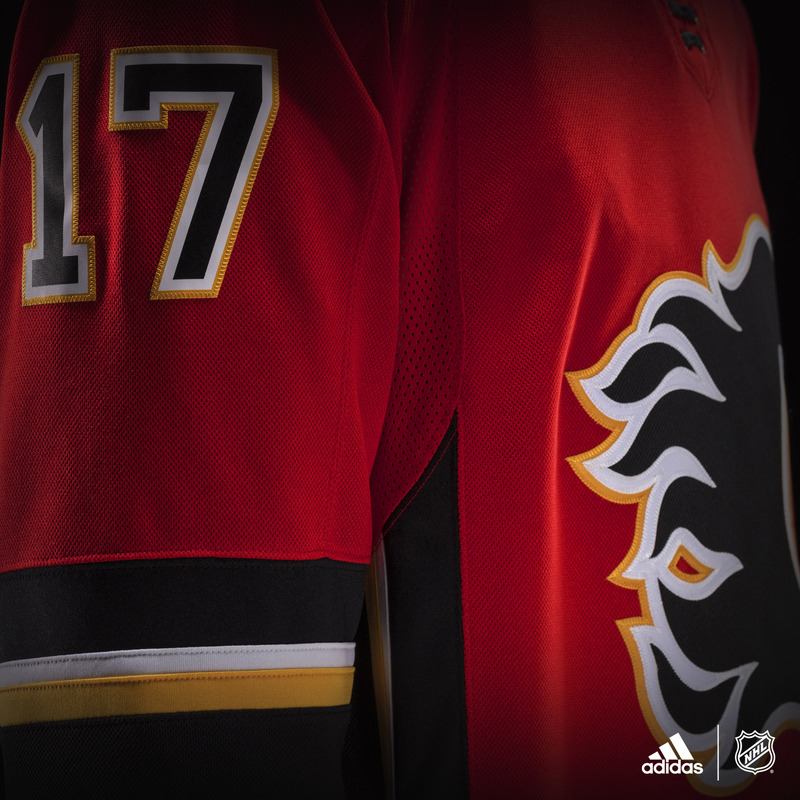 I feel Calgary looks a lot nicer although I was hoping (like many) they’d go back to their classic colours. Too many red & black teams. 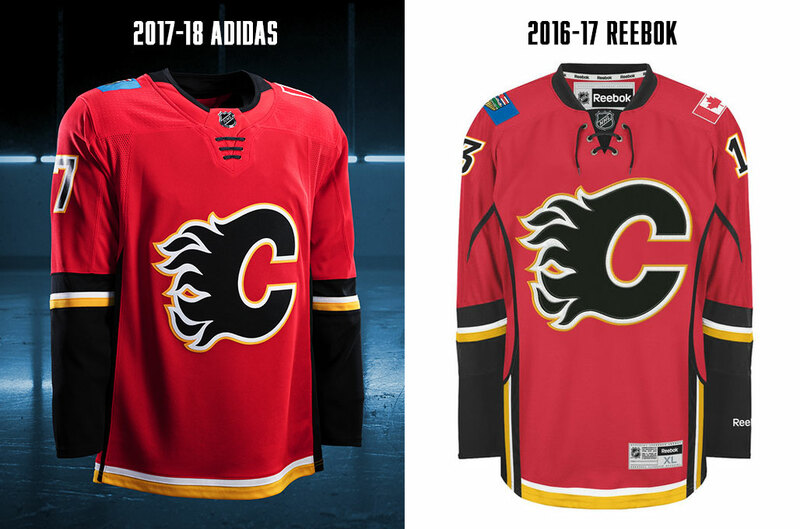 I know they don’t like the white “C” on the red classic jersey but I’ve been wondering why they don’t try a yellow “C” instead. Plus red and yellow is a nice contrast even if it is a bit too McDonald’s. Maybe keep the black as a trim colour. Nashville isn’t as bad as a lot of people are saying but it is missing a bit of blue at the top. Ottawa & Washington were both huge missed opportunities. 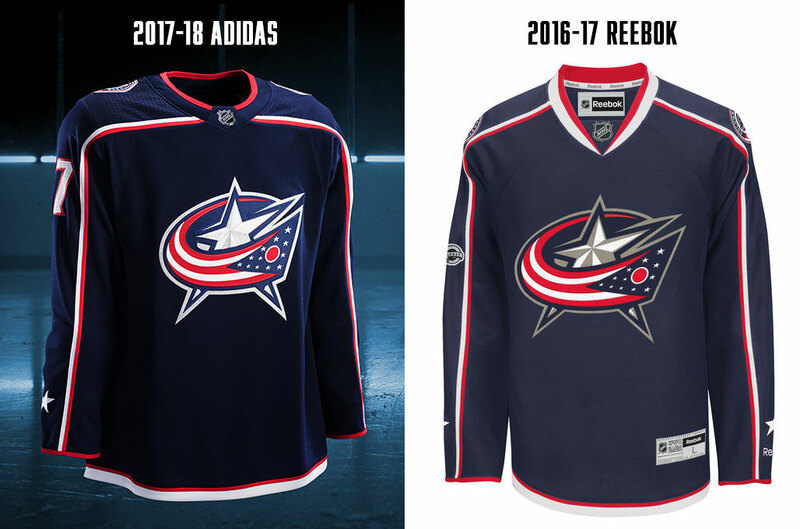 The 2 worst jersey’s in the league (outside of the old Colorado and current Columbus) and they don’t change anything. 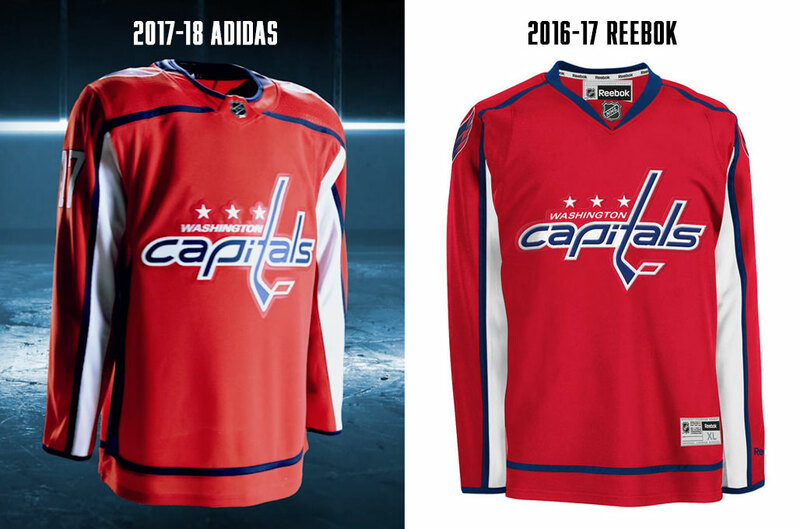 Ottawa could’ve had the nicest black jersey by far and Washington could’ve finally had a nice jersey. 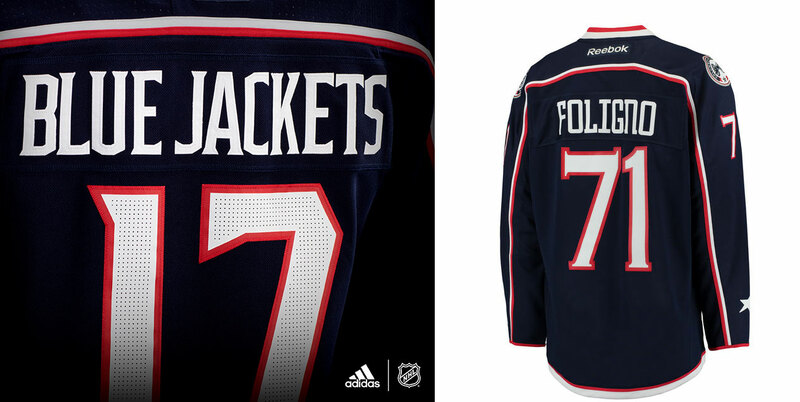 I’ve never liked the Columbus jersey because it’s so boring and dark. Your 2 cents are always welcome. Especially since it’s worth about 3 or 4 cents here in Canada after the exchange rate. Hahaha, I’m Australian so I think our money is worth about the same, isn’t it? Wow, just checked, they are exactly equal.